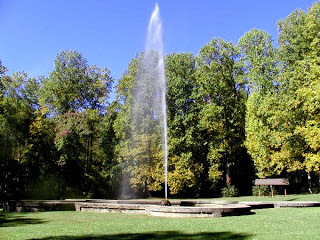 This past week gave us some really sunny days and good temperatures, so we took a short trip down to the Andrews Geyser (about 2 miles from the Inn toward Old Fort). The leaves around the Geyser were just beginning to change and we suspect the color is going to be pretty fantastic this coming week. We also had the good fortune to be at the Geyser when a train came by us. It chugged up the mountain behind us, near where the old Round Knob Hotel stood, passed over a trestle above the road and then about 40 seconds later, passed right in front of us just beyond and above the Geyser. 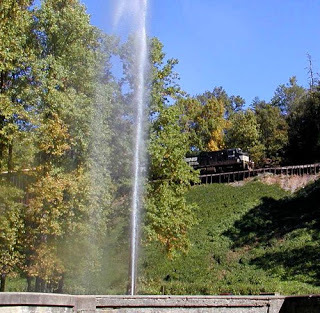 It then looped back around over the road on another trestle and passed by the Geyser for a third time before heading up the mountain to the Swannanoa Tunnell into Black Mountain. They don’t call this stretch of railroad the Loops of Old Fort for nothing. 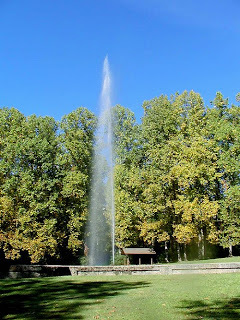 This entry was posted in Uncategorized and tagged Autumn / fall foliage, Old Fort / Andrews Geyser by Inn on Mill Creek. Bookmark the permalink.